Preheat oven to 400 degrees. In a bowl combine flour, greek yogurt, parmesan cheese, salt, and garlic powder. Line a baking sheet with parchment paper. Spray a 1/4 measuring cup with cooking spray and scoop and drop biscuits on baking sheet about 1 inch apart. Repeat until you have 9 drop biscuits. Spray tops of biscuits with cooking spray. 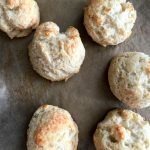 Place in preheated oven and bake for about 22 minutes or until the top of biscuits are golden brown. Enjoy!